I can’t believe how big they’ve gotten, even since last week! Well, here is it, 5 weeks and I’m counting the days until my few hold outs who still have noticeable downy feathers to hurry up and lose it. One of the hens has some on her neck yet and a couple of the boys do, as well, but everyone else is pretty much ready for the brooder lamp to go away. Does ALL the down have to go, or could my hen with little tufts of down on her neck do okay without the lamp? Most of then don’t even sit under it anymore. They all like the boxes of straw now. And now for the update on my little ‘special needs’ chick. We’ve tentatively named him Bud. He’s doing both better, but not at the same time. He can hold his head up, but only for little bits at a time. He has started being able to feed himself out of the dishes I have in the little tote, and he’s not spilling them or tipping them over. He’s started trying to fly, too. HOWEVER… the act of holding his head up right for a couple of minutes tires him out to the point where his breath heaves and he just curls himself up again and lays down. When he does, it breaks my heart. What breaks my heart more is seeing how big and active his brothers in the brooder box are. He should be with them, not in my bedroom. He should be sitting on the perch with them and playing with the bells and toys. Racing around the box. He could live. He seems healthy enough. But what kind of life will it be if he can’t be with the others? DH wants me to give him a week. After watching him hold his head up a few times, he thinks Bud might be able to pull through and a week should show some significant change. If he doesn’t change, though, I can’t put him through it. I can’t. We’ll have to euthanize him, because no matter how ‘healthy’ he seems, be deserves to be a chicken and not isolated from his brothers. Next ›Yikes! 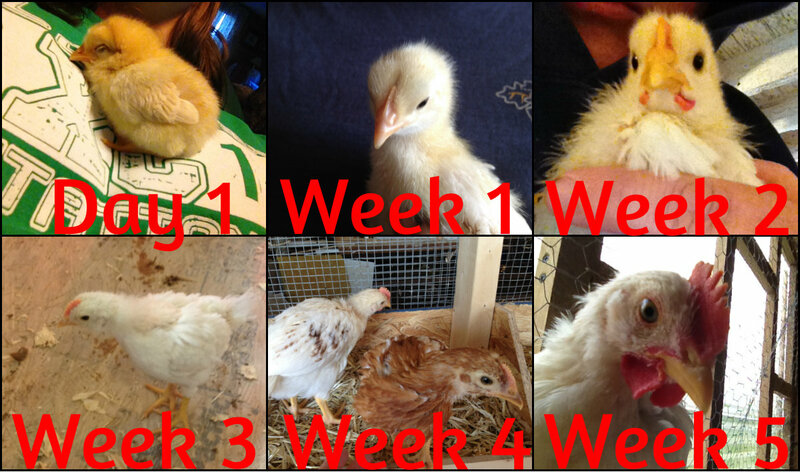 A very Busy Week, Two Chick Week-aversaries and More! Your chicks look good! I would agree with your DH. The next week should show you where he is at. We had one rooster with a deformed foot that managed to get around quite nicely. He was a breed that wasn’t supposed to have a nice personality, however he was beautiful both inside and out. He learned to get around with the rest quite well, but only lasted a year and then passed on his own. That was easier for us, however I hear where you are at. Yeah. I think I could handle it if his foot was bad, but this is his neck and head. Also, the longer we keep him in our home, integrating him back with his peers could be … interesting. I think your “wait a week” idea is good. It sounds like he’s working out that neck and maybe it will get stronger over time. I hope so. If he ends up with no physical issues, integrating him back in with the flock shouldn’t (hopefully) be too rough – I know if there is something “wrong” with a chicken, the others may pick on it, but if he gets strong enough to go back with them, then you could supervise for a day or two to make sure he doesn’t have problems. Thanks! I was just working him and he did well. I set him on our table in a towel with his food and water dishes and see if he will walk forward to them. He not only did that several times but he held his up a lot more while he ate and then ‘flew’ a little, too. Nowhere near his peers but better than where he was on Friday when we discovered him. But all that work wore the poor little guy right out. He’s not quite 2 weeks old yet.